Two expeditions of dwarves oppose to find their way in this dense forest in search of lost mines filled with riches. 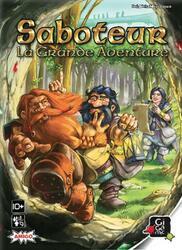 In this version of the board game of the famous Saboteur, the dwarves are represented by pieces that move on the board and must reach a mine to discover it. Moreover the pieces are not played on a player but on the board and can affect everyone. Finally, it may be that a dwarf plays for himself, as a team or even that he owes a double Dwarf-gent. Which team will collect the most treasure and who really plays every member of the expeditions.